In part III of our educational series, we take a break from our review of coins and blockchain-related products that have been proven as scams to review the many types of scams that people use to try to separate you from your bitcoin. Because of the semi-anonymous, semi-legal nature of bitcoin and cryptocurrency, scammers have flooded the blockchain space since its early days. The nature of fraud in the industry has blossomed into a full-blown ecosystem and it is now commonplace to watch naïve or foolish investors trip over each other in a mad rush to get in and out of what they know deep in their hearts to be a full-blown scam. Whether there is too much greed or simply too many people on the planet, the idea of cashing in on “quick money” has become a commonplace mentality. 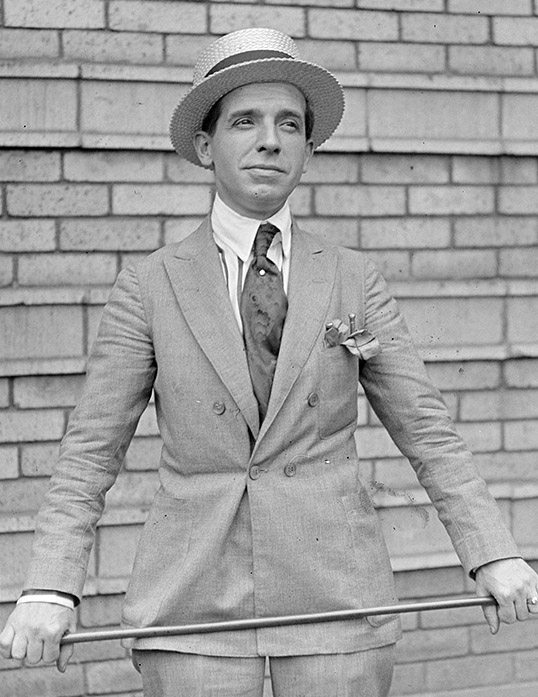 Charles Ponzi, namesake of the Ponzi scheme. Below we will walk you through some of the most prevalent cryptocurrency scams so you can know how to spot them before entangling yourself with them. But before we get started, take some time to become familiarized with these common terms, as you will need to know what they mean to help you determine the difference between a legitimate product or program and a scam. APY: Annual Percentage Yield, the real or estimated % profit on original investment, after a period of 1 year. For your reference, the average APY on a savings account is approximately 0.06%. DD: Due Diligence, the practice of performing one’s own research and investigation into an investment before placing their money into it. This includes research on who is offering the investment (how credible are they), what the actual terms of the investment are (reading the fine print), what the investment hopes to accomplish (what are they actually doing with your money), and what can you expect to get out of the investment (what is being promised and how likely is it to be delivered). HYIP: High Yield Investment Program, a form of a Ponzi Scheme that is characterized by extreme or unrealistic returns on cryptocurrency investments. Some HYIPs offer payouts as high as 50% per week, which is plain ridiculous and the hallmark of a crypto scam, especially when you compare them to an average treasury bond that pays 1%-2% per year. ROI: Return on Investment, the net profit on an investment after a given time period. Between the years of 1950 and 2009, the average annual (yearly) ROI for an investment in the stock market was 7%. This figure has not increased significantly over the last 9 years. Ponzi Scheme: A Ponzi scheme can best be described as a business that isn’t, otherwise known as a fraudulent business. Like HYIPs, they lure investors by offering extremely high, unsustainable returns. Instead of using investor money to fund the proposed business, Ponzi schemers simply pocket the money, using money from new investors to pay the promised returns to older investors. Once the stream of new investor money dries up, the schemer can no longer pay anybody, and closes the business, frequently hiding behind the anonymity of cryptocurrency to conceal their disappearance. Its important to remember that there are no good or trustworthy Ponzi schemes. Pyramid Scheme: These are different from Ponzi schemes in that they frequently offer a real product, but like Ponzi schemes, require a steady stream of new money to be profitable. Successful companies like Avon, Amway and Herbalife are all Pyramid schemes. They rely on a member’s ability to not only sell products but recruit others as salespeople, as they are awarded a small percentage of profits generated by people they recruit. 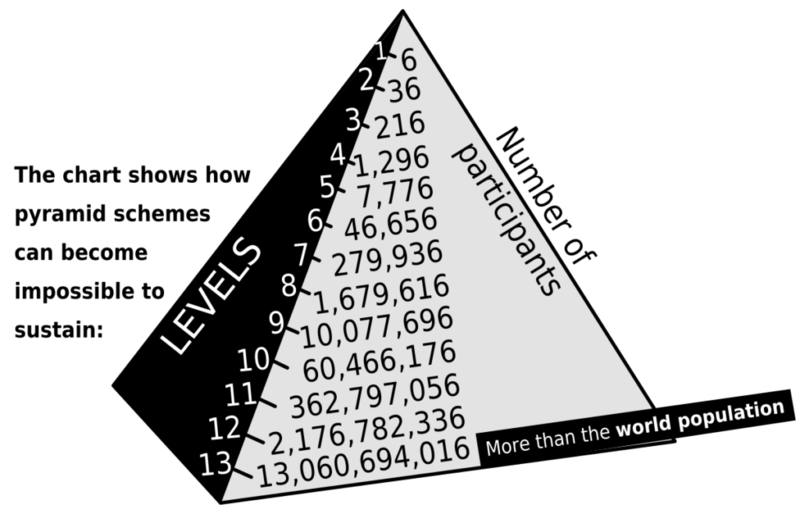 A small percentage of these profits are then given to the people who recruited them, thus creating a pyramid-like shape of levels, with a few people in the top layer making money and a lot of people in the bottom layer losing money. Being successful in one of these companies requires a high degree of marketing skills. Referral: Somebody who joins a program at the behest of somebody else. The referrer stands to receive a given percentage of income generated by the referral; thus the more successful referrals a referrer has, the higher their potential income from the program. Referrals can be acquired through word-of-mouth, special codes entered during the signup process, or a referral link that identifies the program referrer. Bitcoin Loans. This one is pretty straight forward. An anonymous bitcoin user asks a more experienced one for a loan. This is commonplace on public forums like bitcointalk and reddit, and with the help of an escrow service, making money from the principle (interest) on top of a loan can be a lucrative business. 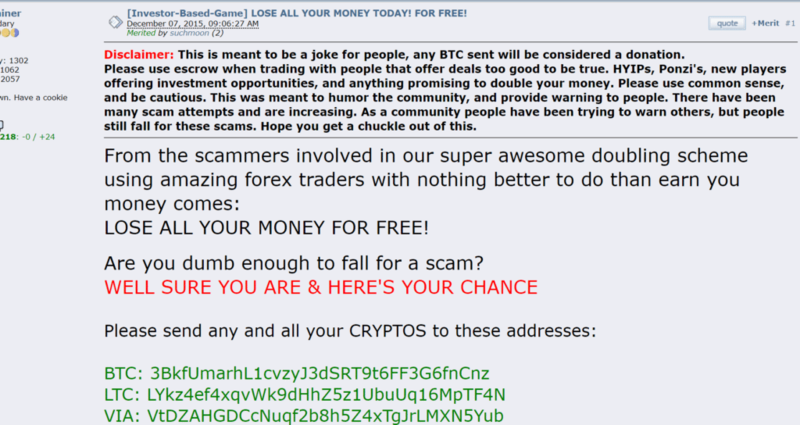 All-too-often, the goodwill and naivete of inexperienced users with bitcoin to spare get taken advantage of by professional scammers, people who make a genuine-looking plead for bitcoin that have no intention of ever paying it back. Bitcoin Doublers. These are usually poorly-thought out Ponzi schemes that claim to “double” the amount of bitcoin you send to an address within a given period. Some of them bother to claim that they are super awesome investment groups, others expect you to just believe they practice some kind of magic. They are all scams and you should never send your bitcoin here. Airdrop Scams. For a long time, Airdrops were simply a way for a coinmaker to distribute its coins in a random, free way. These charitable days are now over, and for the most part an Airdrop will require that you perform some tasks on behalf of the coinmaker or else relinquish some of your personal information. All too often, participants will fill all the Airdrop requirements only to receive nothing in the end, being used as a tool for the coinmaker instead. ICO Scams. While some ICOs (Initial Coin Offerings) are legitimate, it’s a statistical fact that about 90% of them will fold after 1 year or less of being in business. Some fail with the best of intentions, while others fail because they were designed to fail. There are a few effective ways to ensure that your ICO of choice is legitimate: 1) they have public developers, not anonymous, 2) they are backed by well-established investors or creditors, 3) all their information and plans are publicly accessible and not mired in secrecy. 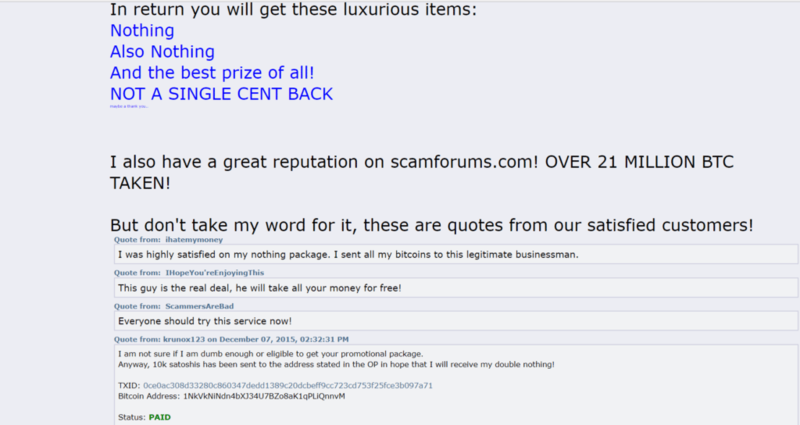 Facet Scams. Bitcoin faucets were originally designed by the early adopters with an altruistic motive: letting people discover and try out bitcoin for free, for the sake of their own education. Its hard to believe now, but the first bitcoin faucet, launched in 2010 by Bitcoin Core developer Gavin Andreesen, dispensed an entire 5 BTC per visitor. Today’s bitcoin faucet is entirely different, sometimes requiring you to deposit bitcoin into it first (don’t! ), or else dispensing out a “dust”-like amount of bitcoin that can only be collected after multiple visits, and frequently supported by a barrage of advertisers. Bitcoin Cloud Mining Scams. Originally, bitcoin cloud mining sounded great in principle: you pay to “rent hashing power” generated by a real mining rig (or pool) somewhere, and in return you receive a proportional percentage of the bitcoin mined by the rig (or pool). The only problem with this is, if a rig or pool was profitable in that it consistently mined bitcoin blocks, why would its owners need to generate income from strangers in the process? There are 2 likely answers: 1) a severe markup is charged to the renters, meaning the rented hashing power is far costlier than the hardware and electricity expenses incurred during the mining process, or 2) there is no mining rig or pool at all and “renters” are simply participating in another type of Ponzi scheme. Background Mining Scams. These websites will install – with your permission – cryptocurrency mining software onto your computer which is then pooled with other website users to mine for CPU and GPU-friendly coins, like Monero (XMR). While some of them are often legitimate and do pay out a little bit of coin from time-to-time, they frequently push referrals as the #1 way for a user to profit from them, rendering such sites something of a Pyramid scheme. Why is this bad? Because obviously the website creator(s) mine more coins if they have more computers running their mining software, and in the long run it would be more profitable for a user to run their own mining operation and not have a substantial margin swiped off the top of their individual mining profits. Basically, you are burning your own electricity and computer down while the lion’s share of the profits goes to somebody else. While you may be able to “earn money by just being idle,” we can’t recommend trying it. Investment Group Scams. These are slightly more sophisticated “Bitcoin Doubling” scams that aren’t quite stupid enough to offer you a 100% return in a matter of weeks or days on your investment but aren’t quite smart enough to know that offering consistent, fixed returns is the most surefire sign of a Ponzi scheme. They claim to take your bitcoin (or other cryptocurrency) investment and pool it with other investors, which they will then use to make foolproof trades that are profitable every single time. They won’t tell you how they are doing it, but if you are an early enough investor, hopefully you will be satisfied with your ROI and not question their super secret, “black box” trading methods. If you are a late investor, you likely will be unsatisfied, especially after the group goes belly-up, often without warning, or any indication of how or when you will get any of your original investment back. Most of these tried-and-true words of wisdom are based on the observance of age-old principles of human psychology, just re-applied to the recently-developed context of cryptocurrency. As we’ve stated in previous articles of this series: while technology may evolve rapidly, the human brain does not. Because biological evolution happens on such a slow scale, the human mind has remained basically unevolved since the dawn of recorded history, even though our technological progress advances ever-more quickly, limited only by the bounds of human imagination. Thus, the same behavioral principles that allowed cave men to cheat each other in barter deals for flint and deerskin allows cryptocurrency users to cheat each other out of their digital coins and tokens. Rule #1: If something sounds too good to be true, it most certainly is. Previously, the expression replaced the word “certainly” with “likely.” However, there are now so many people on the planet competing for the same, limited amount of resources, we feel comfortable making this adaptation to fit the 21st century. We need look no further than your average HYIP which claims to pay out about 20% per month. This means that if you invested $1,000 at the beginning of the year, your ROI at the year’s end would be a staggering $8,916.10, which translates to an APY of 891.61%. To put things in context, the most generous banks offer about 1% APY on savings accounts and convicted Ponzi scheme felon Bernie Madoff offered his investors an APY of only 12%! Rule #2: Don’t invest in anonymous programs. Do not put your money into projects with anonymous developers, owners, or users. Likewise, all testimony and positive reviews written for such programs by anonymous users should be regarded as not just meaningless but a warning sign that a project is likely to be a scam. There are plenty of independent program review sites out there to help you determine the likelihood that a project or website is a scam. The one glowing exception to this rule is bitcoin, whose developer (Satoshi Nakamoto) remains anonymous. A handful of other successful projects like NXT, NEM (XEM) and Monero (XMR) also have anonymous developers, but these are 1-in-1000 exceptions to the rule, and 999 of the other 1,000 times, a developer is remaining anonymous because they do not want to publicly vouch for the authenticity or legitimacy of their project. Rule #3: Don’t invest in fixed-percentage return cryptocurrency programs. There is no way to guarantee a fixed-percentage return! Outside of the aforementioned interest on savings accounts, certified bonds or other highly-regulated investment vehicles, gambling on the markets is always a gamble, and even Wall Street’s best hedge funds seldom outperform the market. They make the majority of their money by collecting commissions and fees from their customers. This is why the best way to make money in any kind of gambling is to “be the house” (or the hedge fund), and not the gambler. One of the sure most signs of a crypto scam is the offering of a fixed monthly, weekly, or even daily return, and these types of programs should be avoided at all cost. Its best to think of it this way: if the people who run these programs are so awesome at what they do, why do they need your money? If somebody can always make a profit no matter what, shouldn’t they have amassed a giant fortune by now? The truth is, they don’t, and they haven’t, and they’re just trying to trick you into handing your money over to them. Rule #4: There’s no such thing as a free bitcoin. Just as there’s no such thing as a “free lunch,” the same thing applies to cryptocurrency. Any program or “opportunity” that says that it is “free” most certainly isn’t. There’s no successful business model founded upon the principle of giving away things for free; it’s simply unsustainable. Yet the word “FREE!” smells like attractive bait to an uncritical mind. Just like with regular advertising, train your brain to immediately discredit or ignore any cryptocurrency program / opportunity with the word “Free” in it. Everything comes with a price, and that price doesn’t have to just be in the form of cryptocurrency. It could take the form of your time (doing work on behalf of the program), your computing power (mining malware), your confidential information (phishing viruses), or your sanity (trojan horse / other destructive viruses). Rule #5: Never, ever invest more than you can afford to lose! This might be the most important one of them all, and as the clear majority of crypto-related projects end up being (sad to say it) failures or scams, it applies particularly strongly to the world of cryptocurrency. Just as there’s no such thing as a free bitcoin, there’s no such thing as a shortcut to investing. Treat investing in a cryptocurrency product or project like you would in a stock or a startup business investment in any other industry: very seriously. Unfortunately, the world of cryptocurrency draws some incredibly greedy people who unrealistic expectations. If you are per chance one of these individuals (perhaps you don’t yet realize it), you are the last person who should be taking out a loan or using a mortgage payment to make an investment in cryptocurrency. Sorry, but the truth hurts, and it will hurt even more if you have to give up your credit, school, or home because you let your greed blind your perception of reality. Now that you have been properly wisened up and your dreams knocked down a peg, you are hopefully on level footing, ready to take on the lucrative but unforgiving world of crypto investing. Blockchain technology is still a budding, young industry, and the chance to profit from it in the future remains enormous. Take some time before plunking all your hard-earned money down into one project, respect your own time and gut feelings, and remember that there will always be more investment opportunities in the future.